A new play can be created by clicking the New Play icon. In the New Play menu, select to create a Play or Building Block, type your Play Name, select your Season, and then select or create new Team and Series labels for your play. Team and Series labels are used to organize and group similar diagrams together, so creating a descriptive and accurate labels will help you find particular diagrams quickly later on. 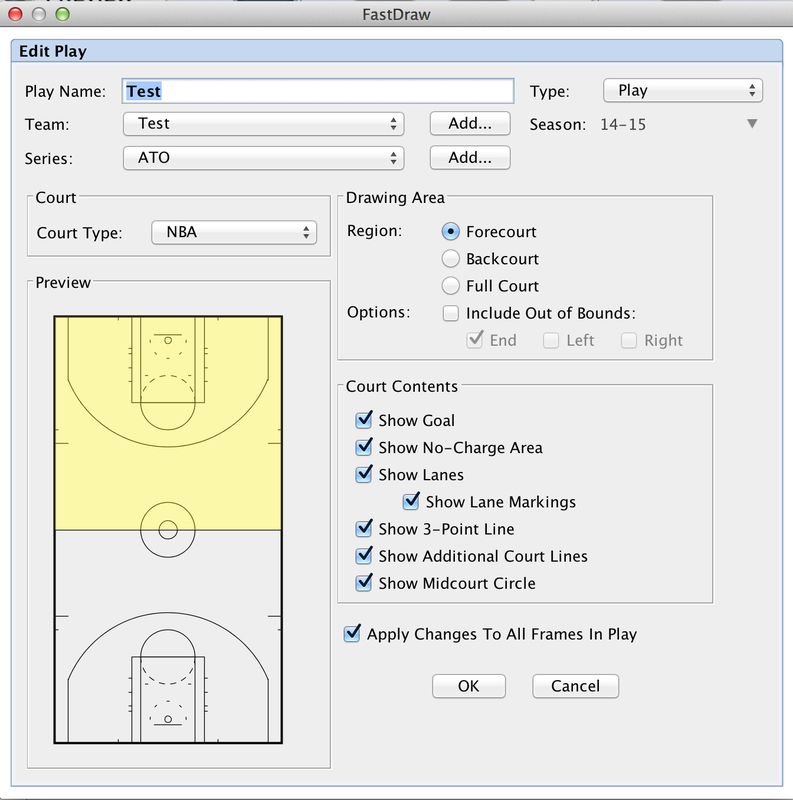 When creating a new play, you have the option to select the court dimensions you would like to use, and which court lines to include in your diagram. Use the "Court" section of the New Play menu to select your court size, the "Drawing Area" section to select full or halfcourt diagrams and to include out of bounds areas, and the "Court Contents" section to control which court lines are shown. 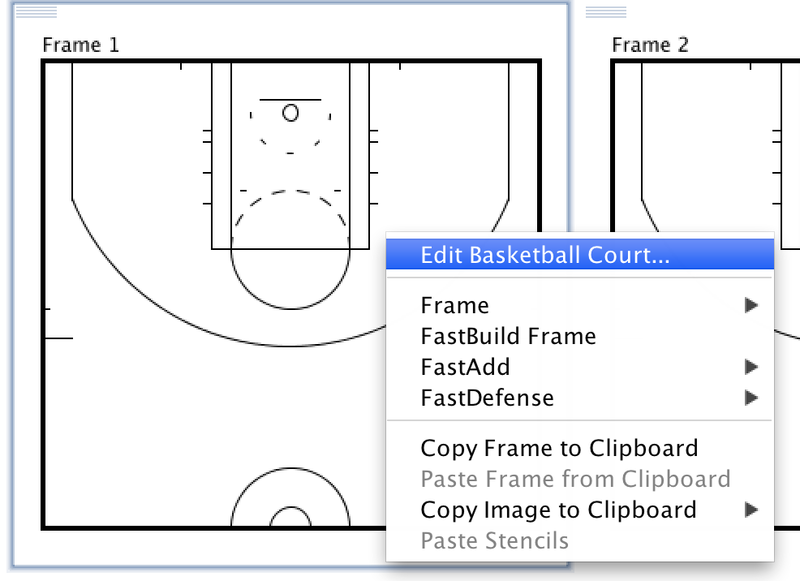 You can also change the court dimensions for any play that you've already created by right clicking on the Frame and selecting Edit Basketball Court. The Edit Play menu will open, which is identical to the New Play menu, and give you full control of your play options. The next step in creating your new play is adding players to the court. You can add players individually to the court by clicking and dragging any number player (1-5) from the Positions palette, or you can quickly add 5 players to the court and give the ball to a player of your choice using the FastAdd button. After adding players to the court you can click and drag each player to the correct starting position on the court, or you can double-click on any player to add a custom label. Any combination of numbers or text can be used to identify a player. With your players in place, you can now click and drag an action stencil from the Actions palette into your diagram. Pick the shape of the action that you would like, and when you drop the stencil into your diagram you will be presented with a menu to select a Screen, Cut, Dribble, or Pass. After placing a straight line stencil, it will appear on the diagram with a green dot at either endpoint. The green dots can be used to move each endpoint into place. When you add a curved line to the court, you will see the green dots on each endpoints, and a yellow circle at the midpoint of the curve. The green dots can be moved to change the endpoints of the stencil, and the yellow circle can be moved to modify the arc of the curve. After adding the first actions of your play in Frame 1, you can advance the players and ball to their next location in Frame 2 by clicking the FastBuild icon.